Carnavalesco (a carnaval artist who designs costumes and floats for carnaval parades) for Portela, one of the top samba schools in Rio de Janeiro, Alex is a long-time friend of Doris de Hilster. They first met when Doris brought Alex, the King of Carnaval in Rio de Janeiro at the time, to the Brazilian Street Carnaval as a celebrity guest. Since, then the two designers have become close friends and now close working colleagues. 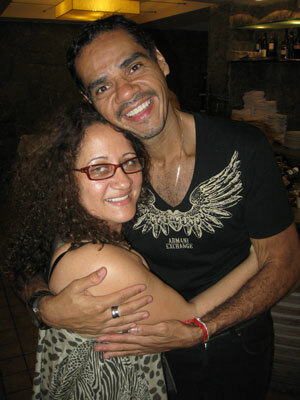 Alex de Oliveria is now one of the top carnaval designers in Rio with many samba schools after his talents. Look for more collaborations between Doris and Alex. Isaac is a recent collaborator with Doris. Isaac was looking for costumes for a model he was shooting in Los Angeles and came across this website and immediately fell in love with Doris' work. Next thing you know, they met, hit it off, and the result were incredible photos from an incredible photographer of incredible costumes on a very beautiful model. Doris is impressed! Congrats Isaac. Look for more photos of Doris costumes with Isaac Mathew White and some of his beautiful model friends.